Heads Up! The following post may or may not contain a Twilight: Breaking Dawn spoiler or two. If you’ve yet to read the book and want to be surprised upon seeing the movie, turn back. Quick! Now that we’ve gotten that out of the way, I’ll make no secret of the fact that while I read the first three books of the Twilight series and enjoyed them for what they were, Breaking Dawn–for me–was a big ‘ol fail. There are lots of plot-arc-motivation-payoff-spawn reasons I won’t delve into here, but suffice to say: I’ve got all kinds of problems with the final installment of Bella and Edward’s story. And, since the literary version of Breaking Dawn wasn’t for me, I wasn’t all that excited about the movie’s November release. I read the enclosed interview (featuring Kristin Stewart, Robert Pattinson, and director Bill Condon) with vague curiosity. I mean, these books and movies are a cultural phenomenon. I couldn’t just skip over it, right? What, exactly, do you think was going on in his head when this photo was snapped? He’s so rumpled and clueless, and he’s always smoking and wearing that distantly befuddled expression. But then–in an Entertainment Weekly interview for a movie he’s supposed to be PROMOTING–he says his character acts like… an incredibly hideous P-word for wimp. 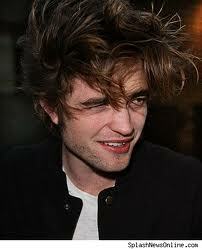 Really, RPatz? Wow. On what he wishes Edward could have said after the honeymoon night: “I bit through all the pillows. Every. Single. One.” And then he’d start crying. On Jacob and “imprinting”: I have to say, it’s pretty creepy. On Edward’s role during Bella’s pregnancy: And I’m just sitting there, like, with a bucket, collecting [Bella’s] vomit. On speaking to Stephenie Meyer about the childbirth scene: What am I actually chewing through? Seriously. If Robert Pattinson is always this funny and irreverent, I think I might like to start hanging out with him, maybe at one of the dumpy bars I suspect he frequents. Wrinkly clothes, unruly hair, cigarettes, and all. *Okay, wait... this might be a *little* bit attractive. You will have to listen to his audio commentary on the Twilight dvd -hilarious! It is funny reading that EW article and seeing what the actors and director thought of some of the more interesting plot points of the book/script. Oh, I’m only going to see the final movies because of my warped sense of curiosity. I do NOT have high hopes. Ha! I have to say, I love the photo of them playing chess. I, too, have failed to see the appeal of R-Pattz. He was very funny in that interview, though. I guess a sense of humor can make just about anyone attractive. 🙂 And yes, I kind of loved the chess photo too. It looked so much more natural than the cover image. Yep, a few chuckles and a few shocked gasps from me. He definitely lacks a filter, which I kind of love! PS I thought of you at camp while the counselors put on a highly entertaining Harry Potter cleaning skit. You had to be there, but know that I though if you WERE there, you would love it. Considering I adore pretty much anything Harry-inspired, I’m sure I would have loved it! And Kristin Stewart… I just feel sort of bad for her. She seems like she’s probably a nice girl, but she’s always so nervous and awkward and twitchy. Poor thing! Oh Robbie, what a crack up. I’ve always thought there was something a little attractive about him. But it may have been his appearance as Cedric DIggory that did it…. Oh, your poor daughter! To get that far into a series and give it up… she must have been terribly disappointed! I’ll probably see the movie too, but mostly because I’m morbidly curious about how they’re going to pull off the whole vampire birth scene. Eek!